There are times in our lives when it seems like we come full circle in our findings. This is one of those times for me. Early on in my research into the HPV vaccines I knew that the L-Histidine which is unique to this vaccine played a major role in what I was hearing from parents and girls adversely injured by Gardasil®. I made the connection between Histamine and IgE release. I was able to make the connection with all the variety of symptoms to the various components of this vaccine. Because of personal experiences I found that the majority of the injured experienced an anaphylactic type incident. The adverse events experienced from the HPV vaccines nearly mirror those of an autistic child even down to the regression. Now I find that not only do the components of this vaccine play an integral part but the main player in this scenario is the probable excessive histamine released because of injected L-Histidine. So basically I am at the beginning but with a sobering twist. Be prepared to be as shocked as I was, because of the simple answer that lay in front of me all these years. It is important to eat foods that are low in histamine. Please always remember that there is no such thing as a “histamine-free diet! My opinion is simply this. Vaccinations are designed to cause an immune response to train the body to attack that specific antigen, pathogen or toxin to protect the body from harm. This is facilitated by the activation of the mast cells by IgE to release histamine. The HPV vaccine Gardasil had VLP’s cultured in yeast and has 0.78 mg of L-Histidine which is converted to histamine which increases the level of histamine in the body. This histamine response causes inflammation. The inflammation depending on why or how the mast cells were activated could be site specific or system wide. Considering that histamine generation can be produced in many organs and areas of the body like the reproductive system and the brain, this inflammation if chronic has the potential to cause auto-immune diseases, brain damage and even death if the histamine concentration is too high. Considering that the L-Histidine is injected intramuscularly has the potential to cause adverse events at the injection site (site specific). 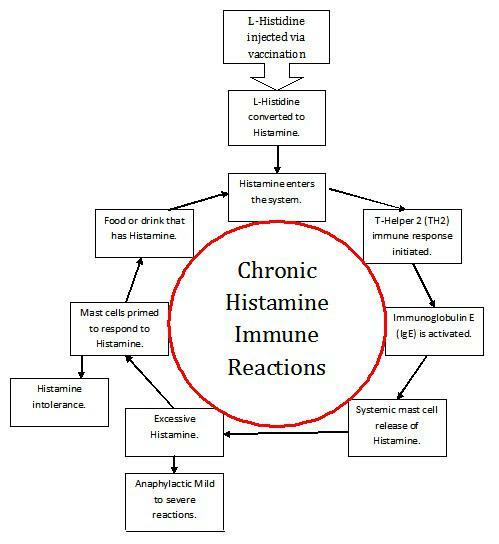 The L-Histidine is converted to histamine which now has access to the blood stream. Therefore, after the initial site specific reaction the newly created histamine will slowly be introduced to the rest of the body causing systemic reactions (system wide). This explains why we have the variety of adverse events and why they may happen hours to a few months later. The mast cells have been primed because of the immune response of the vaccine to target histamine. Now every time a vaccine injured person eats certain foods there is the potential for a chronic anaphylactic histamine reaction from mild to severe. Lastly, I want to thank all the hundreds of parents who I have communicated with over the years. You kept me going in my quest even when I thought no one was listening. You are the warriors and I love each and every one of you. 12. Lassen LH, Heinig JH, Oestergaard S, Olesen J. Histamine inhalation is a specific but insensitive laboratory test for migraine. Cephalalgia 1996;16:550 –3. 13. Huszti Z. Histamine in CNS-resident non-neuronal cells. In: Falus A, Grosman N, Darvas Z, eds. 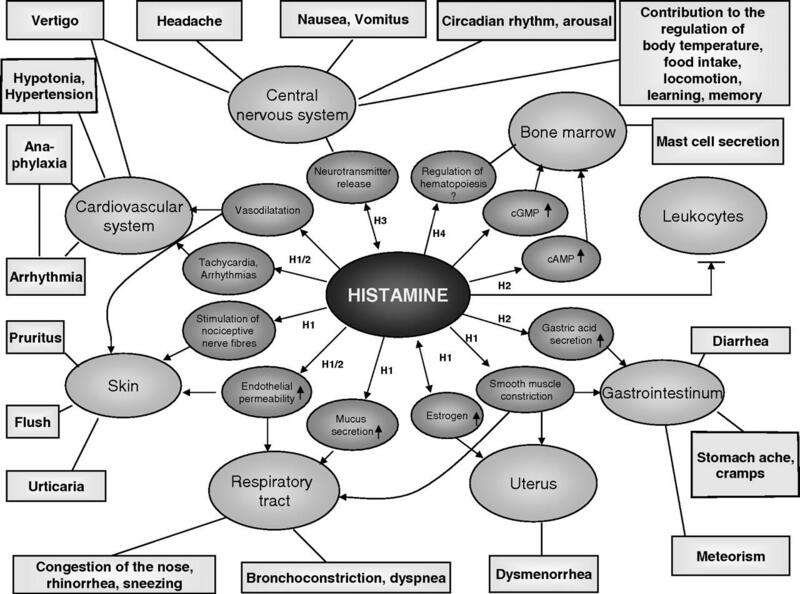 Histamine: biology and medical aspects. Budapest, Hungary: SpringMed Publishing, 2004:272– 80. Cynthia excellent bit of research, the only thing i would add is an article by fF. Grimble from the College of Nutrition Medical School of South Hampton UK. I won’t bother looking it up but to get any histomine you first must have methionine and cystine, the beginning of the sulfur based amino acid chains, where is the sulfur? Gone to flowers is the verse in Where have all the flowers gone, where have all the soldiers gone, to chemically fertilized flowers. Add organic sulfur back into your diet and let no hypodermic needle approach, just say no, its the First Amendment to the Constitution, freedom of speech including our biology. Every issue dis.cussed has been addressed with only organic sulfur and water. 700,000 Study members, 80 countries. Do you want to be healthy or not?